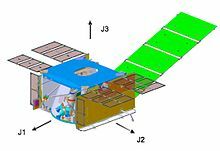 A satellite bus or spacecraft bus is a general model on which multiple-production satellite spacecraft are often based. The bus is the infrastructure of the spacecraft, usually providing locations for the payload (typically space experiments or instruments). Bus-derived satellites are opposed to one-off, or specially produced satellites. Bus-derived satellites are usually customized to customer requirements, for example with specialized sensors or transponders, in order to achieve a specific mission. They are commonly used for geosynchronous satellites, particularly communications satellites, but are also used in spacecraft which occupy lower orbits, occasionally including low Earth orbit missions. Life support (for crewed missions). ^ "TU Delft: Spacecraft bus subsystems". Lr.tudelft.nl. Retrieved 2014-04-23. ^ "Spacecraft Systems". Braeunig.us. Retrieved 2014-04-23. ^ "The James Webb Space Telescope". Jwst.nasa.gov. Retrieved 2014-04-23. ^ "Antrix Corporation Ltd - Satellites > Spacecraft Systems & Sub Systems". Antrix.gov.in. 2009-09-24. Retrieved 2014-04-23. ^ "Status of the JWST Sunshield and Spacecraft" (PDF). ^ Satellite Bus Subsystems Archived 2012-09-05 at the Wayback Machine, NEC, accessed 25 August 2012. This page was last edited on 18 April 2018, at 03:19 (UTC).